Well, to be fair, every season here in California is grilling season. Even on rainy days I’ll still send Shawn out onto the deck with some chicken to grill up. But now that it’s sunny outside I’ll go out and join him with a cold glass of wine. It’s the best. Using the barbeque is one area I feel completely clueless when it comes to cooking. I’m not even sure I know how to turn it on. Grilling is all Shawn. He is the king of it. And I of course love it because it means I just prep everything, hand him the meat and veggies on a platter, then relax on the couch until everything is cooked and ready to go. These steak and vegetable kabobs are the perfect summer dish. The steak is marinated in a delicious garlic and ginger Asian marinade. Gives it great flavor without adding a ton of extra calories. I’m a real stickler for steak that’s cooked medium-rare/medium, so to make sure that the steak and vegetable kabobs are both cooked perfectly I like to keep them on their own skewers. That way I can pull the vegetables off as soon as their done cooking, and keep the steak going. And by me, I of course mean Shawn. Because he does all the outdoor cooking. And I’m going to keep it that way. Make the marinade by mixing all of the ingredients in a medium size mixing bowl or ziploc bag. Add in the steak and marinate for at least 20 minutes and up to 24 hours. Make the veggie kabobs by alternating all of the vegetables, spraying with nonstick spray, and seasoning with salt and pepper. Make the steak kabobs by skewering the steak. Preheat the grill to medium heat and oil the grates. Put on the vegetable and steak skewers at the same time. Turn the steak after 5 minutes, and cook for another 5 minutes. Brush the steaks with extra marinade as they are cooking. Remove the steak when cooked thru and tent with foil. Meanwhile, turn the vegetables every minute or so until they are cooked thru, about 12-15 minutes. Remove from heat and serve immediately. Leftovers will keep refrigerated in an airtight container for 5 days. Well, that’s the beauty of grilling season, right? That the husband gets to do all the grilling? :) These look delicious! I’m so excited that it’s finally grilling season! My husband is the grill-master too, I don’t even know how to turn that thing on! But these kabobs look like the perfect summer treat! Beautiful pictures, too! Our grilling season is here as well. I love it too. Kurt does all the work and I hang out with a glass of wine. We’ve been grilling for the last few days, I just can’t get enough of it right now. I love these beautiful steak kabobs Natalie, especially with veggies like that. Perfect summer meal. I definitely approve of your method of barbecuing, Natalie i.e. sit back and let your man do most of the work! I can’t believe you can barbecue all year round – that must be so wonderful to not really have a proper winter. P.S. 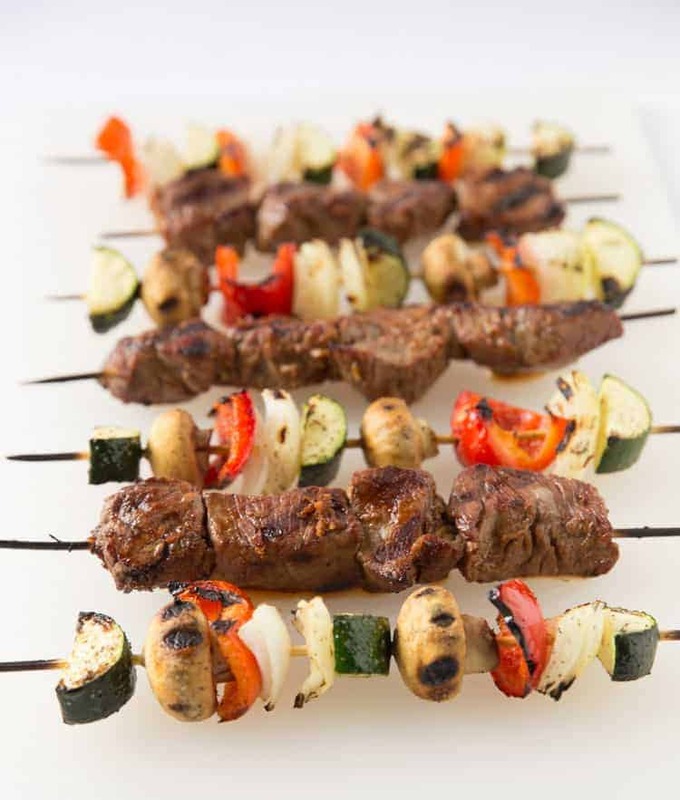 The kabobs look and sound super tasty – like the sound of the marinade! Yum! So excited for grilling season! Vegetable kabobs on the grill are the best and I have no clue why I’ve never made steak kabobs. Such a quick and delicious weeknight meal. They look tasty. 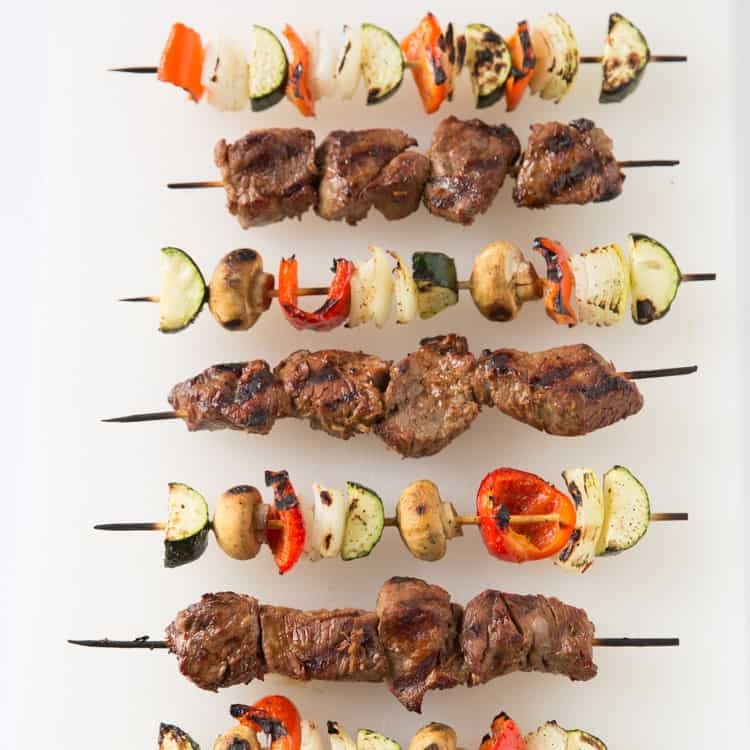 love kebabs and loooove this quick & easy recipe – SO relieved it’s finally grilling season!! I love steak and veggie kabobs. I agree it’s best to keep them on separate skewers. This looks delicious! We literally just got our first grill EVER 3 days ago. And we grilled salmon and forgot that we didn’t have any grill utensils and we didn’t oil the grill first and half of one of the filets fell in, but it was still great. Pinning this! So excited to try it Natalie! Yay for grilling season! My favorite season of the year! I just made some easy steak and veggie kabobs for dinner tonight, and I love the addition of ginger in yours! My favorite part about this meal is you have your protein, and veggies all made on the grill. You really don’t need anything else with it! I’m all about the veggies and kabobs (and steak too ;) ) Nice that Shawn does all the grilling….if only I had a man to do it for me. The fact that I don’t though, has actually made my “I can’t grill” attitude to being forced to grill and have become pretty decent. Haha…but MAYBE when that man comes around i’ll go back to “I can’t grill.” It’s just such a good excuse to not be in charge of dinner, eh? Hope you had a lovely day! Absolutely thrilled for grilling season! 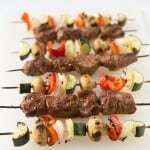 What a great way to kick yours off with kabobs – can you believe I haven’t done that on my own grill yet? I think it’s going to have to change this season!! I always tell my husband to go out and do the grilling. But, shocking surprise, I always end up doing it! I’m going to add these beauties in the rotation ASAP! I love the beautiful mixture of colors and those steak kabobs look so delish! I’m so happy it’s finally grilling season! 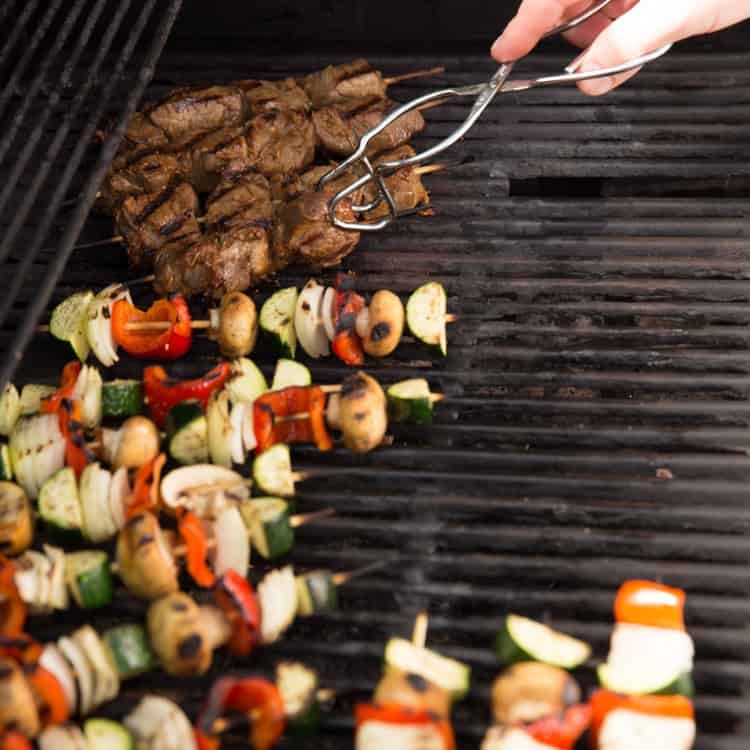 Haha love the way you grill girl, it’s the same way at our house too :) Yay, so happy grilling/patio season is finally here – these kabobs look absolutely mouthwatering and I love the sound of the marinade! We love love grilling season! During this time of the year I could easily grill every meal we eat. The best part is my hubby does all the cooking. I prep, but he loves hanging out there by the grill. Kabobs are one of our favorites to make. They are something everyone in the family loves :D These look delicious! Love all those veggies! Oh so good! I just love me some kabobs. What’s not to love though when it involves grilling and summertime? Ahhh….my best time of the year. Have a wonderful Wednesday Natalie! Yay for grilling season! My hubby and I could grill pretty much every day during the summer – it’s the best. Kabobs are one of my favorites to throw on the grill and your marinade sounds absolutely incredible. Yum! I’m just loving these kabobs for this holiday weekend! They look so delicious! I am totally with you when it comes to grilling. I feel like Zach does a far better job than I ever could! Pinned! Thanks Kathleen! My grill is embarrassingly old. I’ve been keeping my eye out for a good one, and a ton are on sale this weekend for Memorial Day. Might just need to treat myself to one and break it in over the long weekend! Grilling is the best!! Such a great idea about separating the veggies and meat onto their own skewers. That would be super helpful when we grill for more than just my boyfriend and I, because we have people who love rare meat and others who ask us for well done…and when we think it’s there, keep it on for a few more minutes. Those poor veggies would be charred otherwise. Loving the sound of that marinade, too! I often separate my meat and veggies on skewers to give vegetarians/vegans an option but I never thought of it as a way to cook both the meat and vegetables perfectly – so smart! I saw this picture you posted on instagram and had to come checkout the recipe – yum! What are the carbs per serving for this recipe? 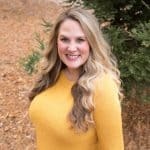 I calculate all my calories and nutritional info on myfitnesspal.com!